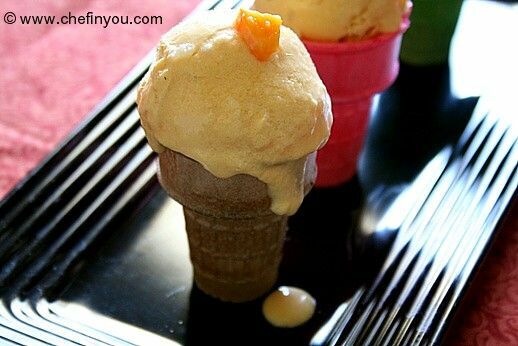 Note: This recipe uses Raw eggs (although pasteurized ) for making this ice cream preparation. 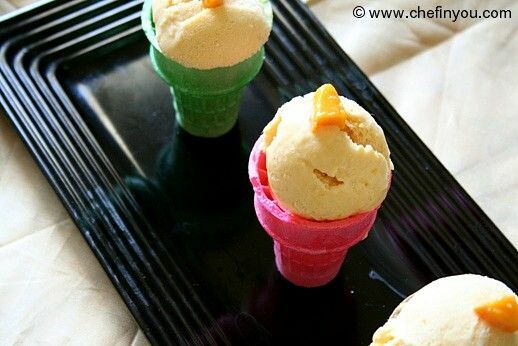 See this article for more info .If you are still not comfortable, you can instead make Mango Kulfi Icecream recipe instead. 1. 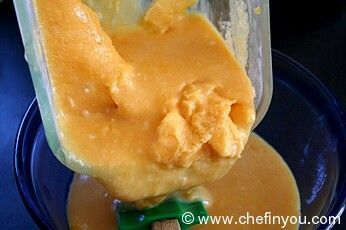 While you can use Store bought Mango pulp for this recipe (decrease sugar accordingly since I personally find them too sweet), I like the puree made from fresh mangoes. 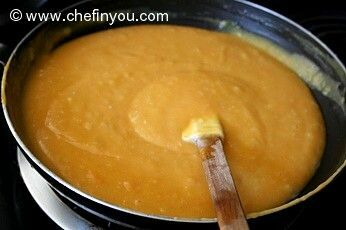 Peel the mangoes and make a puree of the pulp with lemon juice. Keep aside. 2. 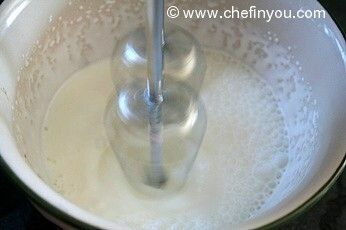 Mix together coconut milk and half the milk in a saucepan. I used a wide/deep nonstick skillet. 3. 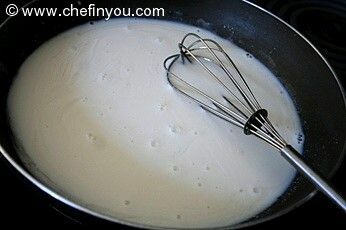 In the remaining milk, dissolve the cornstarch. Add sugar and salt. 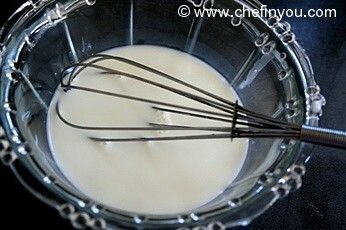 5. stirring constantly, until a thick custard is formed. 6. Add the scraped/grated coconut. Mix and set aside to cool. 9. 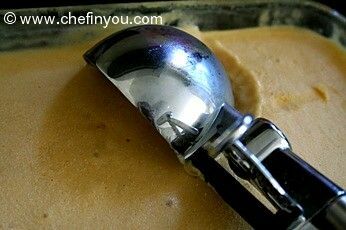 Pour into a lidded bowl and place in the freezer until half frozen. 11. until soft peaks are formed. 13. 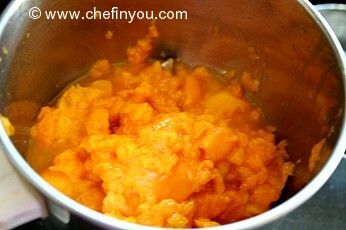 Transfer the mango mixture to another bowl. It will be half frozen. 14. 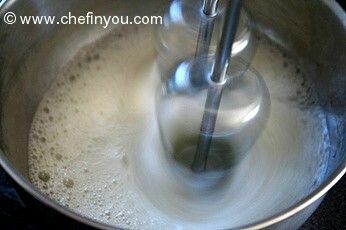 Add the beaten egg whites and mix until smooth. 15. 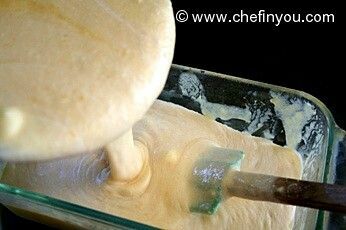 You just want to slowly fold it gently until well mixed. 19. 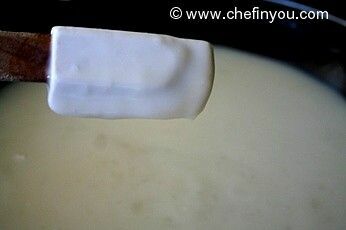 Before serving, run your icecream scoop under hot water. Scoop the icecream - I find warming the scoop makes it easier to scoop the ice cream out. 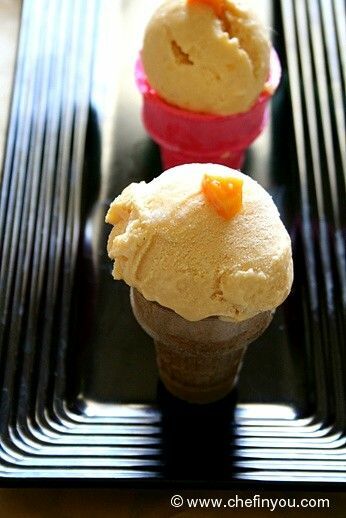 Place it in a bowl or on a cone - whatever you prefer. 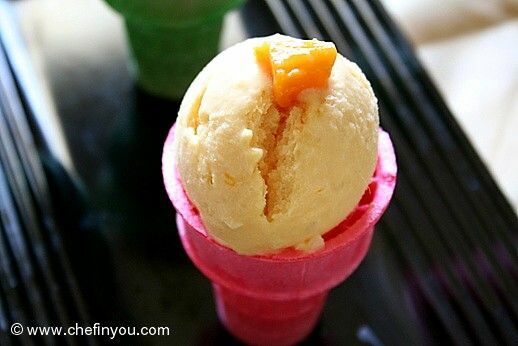 I used a multi colored cone and topped the ice cream with a small mango piece. Unlike me, you really don't want to be persistent about trying to take a decent picture cos if the day was as hot as I had, you will find the icecreams melting in matter of minutes!!!! 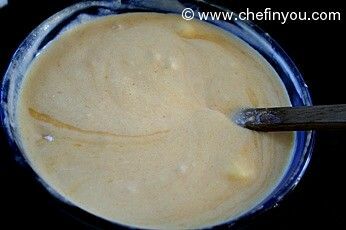 Wasting this absolutely creamy mango coconut icecream is a sin! I love to hear from you! I read each and every comment, and will get back as soon as I am able to. Did you try this recipe? Please share your feedback! You need to login to share feedback. Use one of the following to login. Hi folks!!! 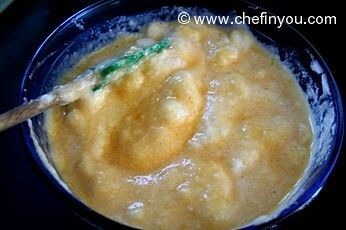 I know that it is 4 yrs later (2014), but listen carefully... you do not need eggs to make your custard. 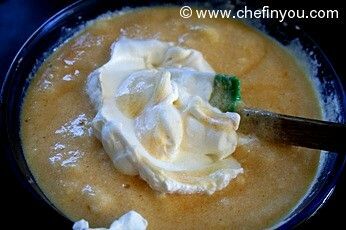 In the Caribbean we use custard powder which is really vanilla flavored cornstarch. 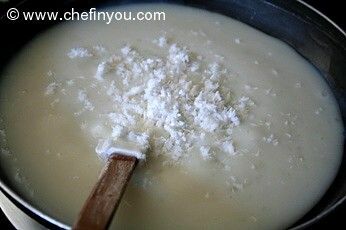 You can use plain cornstarch... wet with a little COLD water, add boiling water, stirring constantly to avoid lumps, if lumpy... blend or simply strain out lumps... add to recipe while stirring. We (in the Caribbean)never use regular milk nor sugar. 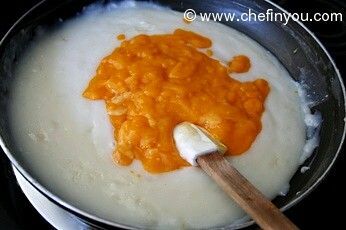 We use only evaporated and sweetened condensed milk. 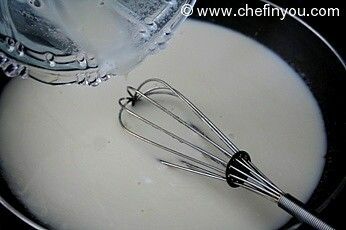 To prevent salmonella use the egg whites sold in the little milk cartons as they are pasturized and safe to use. Other wise use more whipped cream. 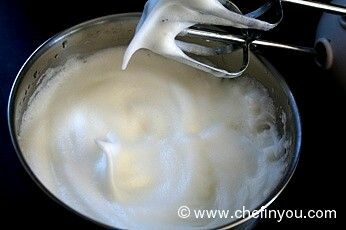 hi...what id the cook the egg white in the double boiler...would it spoil the taste in anyway??????????? Can we replace the mangoes with any other pureed fruit?and the coconut milk with normal milk if we don't want the coconut taste for other ice cream flavours? or this only works if it has coconut and mangoes? love how detailed your pictures are, they really help in the process of making something! Coconut milk and regular milk. I mention it separately. Is this your question? :) Awesome post - thanks for all the detailed pics. I got myself a box of mangoes, and they are all superripe, I have to do something with all of them before they go bad, and I chanced upon this post. I am so trying this!!! I've never made ice cream at home before - this will be a first! So does this ice cream contain raw egg whites? I don't get it. 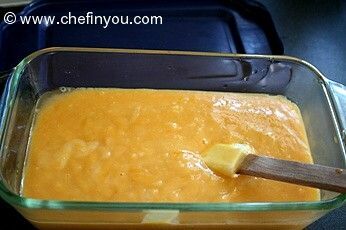 Does using applesauce instead of eggwhites work in this case? What's a good egg-replacement for this recipe? Thanks! Wow! what a great recipe.. 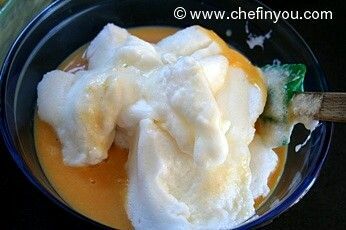 I'm definitely going to try this probably soon 'cos I have some mangoes & coconut milk sittig i my pantry. Feel like having some, truly tempting icecream.. Note that this is a lacto-ovo-vegetarian site.